Josiah’s Musical Arts Programme (MAP) is an integrated arts programme for children from N1 to K2 levels. 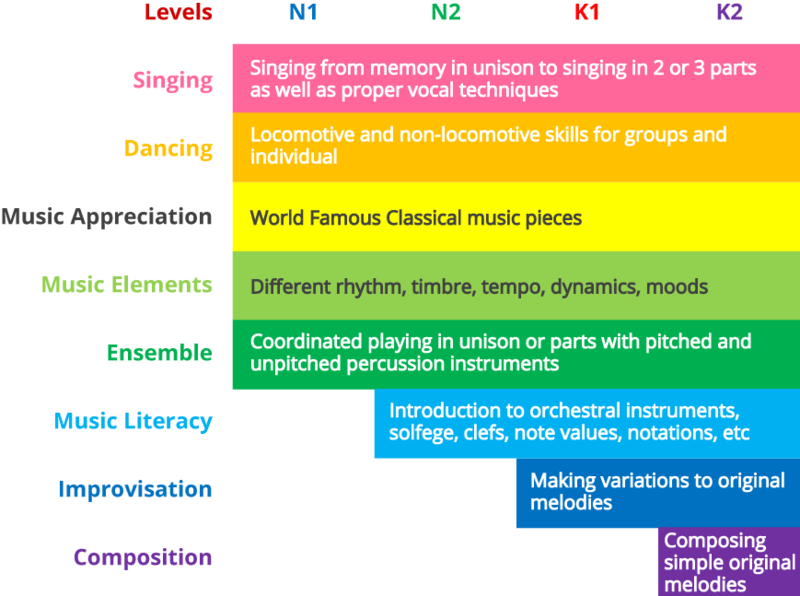 As an integral part of The Josiah Way (along with the Montessori curriculum), the MAP curriculum incorporates philosophies and methodologies of acclaimed music specialists such as Hillary Henshaw, Kodaly, Dalcroze, and Carolyn Lucento. Based on Josiah’s philosophy to celebrate the uniqueness in every child – the programme aims to harness each child’s cognitive development as well as their innate need for creative expression through the Arts. It aims to provide broad exposure in 5 areas – vocal training, dance, art, music appreciation and Chinese speech & drama – as a foundation for children to further develop their passion during the primary years. With diverse exposure, creative engagement and musical experiences, the ultimate goal is for children to develop a love for music and to express themselves with ease and confidence through the performing arts. Ignites all areas of child development: intellectual, social and emotional, motor, language, and overall literacy. It helps the body and the mind to work together. Accelerates brain development as it touches the areas of the brain that are responsible for language development, sound, reading skill, spelling skill and speech perception. Exposing children to music during early years helps them learn the sounds and meanings of words, counting and sequencing as well. Accelerates auditory system when it is stimulated by music. This system is also engaged in general sound processing which is essential to reading skills, language development and successful communication. Builds motor skills while allowing them to practice self-expression as they dance to the music. This also helps to strengthen the children’s memory and ability to retain information. Builds team spirit. It can be a dynamic social learning experience. Making music together encourages children learn to work as a team while they each contribute to the song in their own way. At the same time, music helps children learn that together, they can create something larger than the sum of its parts. Development of Emotional Quotient (EQ) in terms of learning how to cooperate, share, compromise, and concentrate. Such skills are invaluable and indispensable as they continue progressing to celebrate more milestones in life. Provides children with joy, confidence and spontaneity in making sounds and creating their own dance steps.